If you’ve written a grant proposal, you know the drill. You send it off to the funder. If you’re lucky, the funder asks you some questions after reading the proposal. If you’re really lucky, the funder comes on-site to see your great work in action. They’ll also likely drill you for details of your financial health, evaluation methods, and/or governance practices. It might not be painful. The walls go up around the funder’s decision-making process. They’re reinforced by soundproof curtains, unstated locations, and maybe an armed guard or two. You’re hoping the decision-makers are kind to you and that maybe they’re having good snacks so they don’t get too surly. You sweat and wait for a call or email from your contact on the inside. When the news comes, it’s a crap shoot as to whether or not you understand why the funder made its decision. It doesn’t have to be this way, and a government agency is the inspiration. I had the recent pleasure of serving on a grants panel for Cuyahoga Arts & Culture (CAC), a county agency charged with distributing a one-and-a-half-cent-per-cigarette tax. State and local arts agencies have a rich history of transparency in their grantmaking. I’ve experienced this first-hand in Indianapolis and Pittsburgh as a staff member running the process, a volunteer panelist, and a board member of a nonprofit applying for money. CAC’s panels met at the Idea Center at Playhouse Square, a cool downtown space with easy transit access and streetfront window views into the panel. Anyone could walk in and listen. (I’ll admit that it was the last warm day of the fall so we likely didn’t attract an audience beyond grant applicants). The Idea Center’s staff streamed the panel conversations live on CAC’s web site and the recording will be available to anyone for later listening. 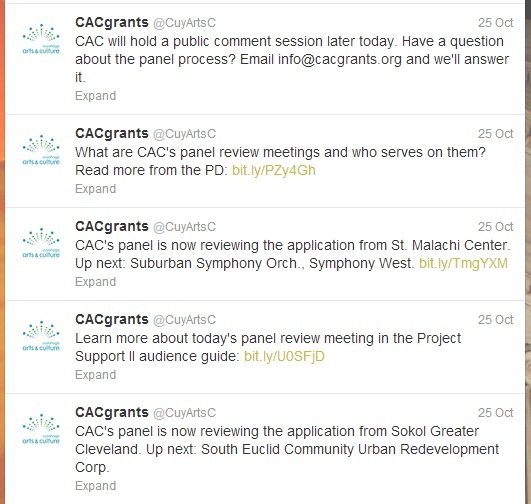 CAC’s staff used Twitter and Facebook to keep the public posted on the panel’s progress. Applicant organizations and members of the general public were invited to provide feedback on the process at the panel conversation and via email or social media. They could also submit factual corrections in case the panelists said something incorrect about the organization or proposal. The panel’s scoring criteria were clear, transparent, and provided to applicants up-front. Forty-five percent of the score was weighted to public benefit, with an eye to how the applicant actively engaged the community in planning the arts programs and host the applicant thought about community accountability. I’m sure not all applicants were excited about the process. They couldn’t sell the panelists or staff members on their proposals’ merits. They had to listen to sometimes tough assessments of how their projects didn’t meet the scoring criteria. The panelists weren’t from Cleveland and only knew what we read about the organizations and the communities they proposed to serve. The application process probably took too much effort for grant awards under a thousand or two thousand dollars. But, it was likely tough to beat the fair shot the applicants received at obtaining money and obtaining feedback on their proposals. What if philanthropic foundations did grantmaking the way Cuyahoga Arts & Culture does? I’ll concede that foundations have the legal right to say little more than what’s published in their IRS 990 forms. I’ll likely even defend the right, in many circumstances, to that privacy and the freedom it can provide. The Nonprofit Quarterly’s Rick Cohen wrote this summer about the potential benefits of increased disclosure in the foundation community, including better civic engagement in and understanding of philanthropy. That’s the same benefit the CAC gains from its transparency – everyday citizens understanding how their tax dollars benefit the community and feeling they have a voice in the process. Foundations aren’t immune from the public’s increasing mistrust of traditional institutions (see here and here for stories on this). And, in the upcoming debates about federal tax reform, it will be an easy populist win for Congress to throw endowed institutions under the bus in favor of direct help to everyday Americans and small hometown charities. Foundations shouldn’t be legally forced to be as transparent as the CAC. But we’d do ourselves a big favor if we chose to act as transparently. Tony – Thanks for sharing this. What a rewarding experience this must have been for you as a panelist as well as for the grant seekers. I actually met someone from the CAC a few weeks ago. Her name is Jennifer Miladin, and she is married to one of Joe’s cousins. Sounds like a fantastic organization, and how great for them to have the resources they have from the state to do what they do for the arts in Cleveland!